When most people plan a day trip to Yilan, their itinerary usually consists of spending time enjoying the beautiful mixture of mountain and ocean landscape, relaxing in a volcanic hot spring bath and of course ending the day with a visit to the famous Luodong Night Market (羅東夜市). Being the preferred destination for the residents of Taipei, the east coast comes alive on weekends and holidays with city dwellers looking to enjoy a bit of relaxation in one of Taiwan’s most beautiful areas. I’m not most people though. Sure, I’m a fan of hot spring resorts and yes the Luodong Night Market is absolutely amazing - But these things are usually only afterthoughts when I’m planning a visit to the area. The cool thing about Yilan, (at least for me) is that it is full of temples - historic and modern - and they are all huge. You see, Yilan is made up mostly of farms and that means there is a lot of space. It is also full of farmers, who have over the past few centuries pooled together their wealth of resources to construct ornate temples that on average dwarf in size the temples that you’ll find throughout the rest of the country. If you’re a temple-hopper like myself you can most-definitely look forward to a long and enjoyable day exploring whenever you visit Yilan. I realize that most people aren’t as enthusiastic as I am about this kind of stuff but I still highly recommend that you at least stop by one of Yilan’s massive places of worship to learn a bit about the culture of the area. While most of Yilan’s temples go out of their way to be large and ornate, the county’s Confucius Temple sits quietly and with little fanfare in the middle of the downtown core of Yilan City. Confucius Temple’s can seem a bit out of place when compared to Taiwan’s other places of worship considering they stress a philosophy of simplicity while all the Taoist and Folk-Religion temples go out of their way to be the exact opposite. If you’ve followed my blog over the past few years you may have noticed that one of my personal projects has been to photograph and introduce Taiwan’s various Confucius Temples - Most of which receive very little attention from English-language writers or travel guides. This historic temple has been on my list of places to visit for quite some time and although I was forewarned that it is a bit disappointing in comparison to the other Confucius Temple’s around the country, I was still happy to be able to check it off the list and introduce it to anyone who’d like to visit. There is very little English-language literature available online about this temple but what you will be able to find is the bold claim that the temple has a long history dating back to 1868. While this isn’t technically a false claim, it isn’t exactly true either. The history of the Yilan Confucius Temple is actually a tale of two different temples which were constructed in two different locations. You may think that this is some sort of translation error but Chinese-language literature is quick to offer the same dates as historic fact. Basically the history of a “Confucius Temple” in Yilan, or the “organization” that took care of the temple dates back over a century and a half but doesn’t actually relate to the building that you see today. Dating back to the Qing Dynasty, the original Confucius Temple was constructed near the Eastern Gate (東門) within (was was then) the walled area of “Komalan Sub-prefecture” (葛瑪蘭廳). The original temple was modelled after the design of the Tainan Confucius Temple but was renowned for having the ‘Most beautiful Dacheng Hall in all of Taiwan’ (全台最美的大成殿). Today all that remains of the original temple is a simple brick wall in a narrow alley within the Xinming Road Central Market (新明路中央市場). Construction started in 1868 and when it was completed a few years later it was the largest structure within the walled-city and also one of the most important. Unlike the current iteration of the temple, the original was considered to be a more “complete” Confucius Temple which (as mentioned above) was based off of the Tainan design. The temple consisted of a Lingxing Gate (櫺星門), Dacheng Hall (大成殿), Chongsheng Hall (崇聖祠), Minglun Hall (明倫堂), several different gates, a pond, a bridge, a courtyard, etc. During the latter stages of the Qing Dynasty, emphasis was placed on the promotion of Confucian-style education and governance making the temple an important symbol and the only one on the eastern coast of the island. When the Japanese Colonial Era began in 1895, the government was quick to institute modern educational reforms and the temple was repurposed as a medical centre until a proper hospital could be constructed. When the medical facilities were later relocated to a newly constructed hospital, the temple complex was left abandoned and fell into a state of disrepair. In the years following it was damaged several times by typhoons and earthquakes as well as the American bombing campaigns during the Second World War. In 1951, a series of devastating typhoons damaged the temple beyond repair and it was decided that it would have to be torn down and rebuilt. In Taiwan, the demolition of a Temple is no simple matter and there are an infinite amount of considerations that need to take place before a temple is torn down. Confucius Temples are a bit different than Buddhist, Taoist or Folk Religion places of worship in terms of superstition, however there is still a tremendous amount of respect for the building and what it stands for. So, when it came time for solutions to deal with the dilapidated Yilan Confucius Temple it became a situation that created quite a few controversies. First, the demolition would have to be taken care of in a respectful manner, but the company that was charged with its demolition was charged with violating its contract and stealing the precious timber that was used to construct the temple. While the temple was being demolished, the question of where the new temple would be constructed also became a point of contention that erupted in public protests. The government had selected the site of the Yilan Shinto Shrine (宜蘭神社) in the nearby Yuanshan Township (員山鄉) as the place where the shrine would be built. The problem with this was that even though the Shinto Shrine was a reminder of Taiwan’s colonial past, it was still considered a sacred site, so replacing it with a Confucius Temple proved to be quite unpopular. Another issue is that Confucius Temples are traditionally constructed near schools on a flat piece of land - The site of the Yilan Shinto Shrine however wasn’t near a school and it was constructed on a mountain which meant that the construction of a Confucian Temple in this area would defy traditional architectural standards which were set almost a thousand years earlier. The government eventually capitulated and selected a site that was near Yilan City’s North Gate (北門) and more importantly, next to a school. Unfortunately the project to construct a new temple met with financial constraints and forced the construction team to take shortcuts not only with the design of the temple but also the materials that would be used to build it. While the current temple generally follows traditional standards, they had to make concessions and used concrete instead of wood to imitate the tradition designs. That wouldn’t be the last controversy though as while the new Confucius Temple was still under construction it was decided that the site of the original temple would be converted into a traditional wet market, which for some people was an insulting decision. This time however the government didn’t capitulate and a 1200 square meter market known today as the Xinming Road Central Market (新明路中央市場) stands in its place. Construction on the new Yilan Confucius Temple started in 1952 (民國41年) and as mentioned above would end up being a project mired by controversy. The controversies would continue for the almost two decades it took to complete the project which is coincidentally a reflection of the current state of the temple - Which is suffice to say, one that is not very impressive and is sadly unkept. In 1954 (民國43年), two years after construction on the temple complex started, the Dacheng Hall would be the first building to be completed making it the oldest structure on site. It would take until 1969 (民國58年) for most of the other pieces, including the Chongsheng Shrine, Dacheng Gate, side halls, etc. to finally be completed. One of the common features of Confucian Temples is that they are very minimalist in design and decoration. The Yilan temple however takes that simplicity to an extreme which is not something that was originally intended. I’m not really able to sugarcoat things when it comes to this Confucius Temple - It isn’t that old but it looks really rundown and uncared for - which is something I was warned about before I went to check it out. Unlike its counterparts in Taipei and Tainan, this version likely isn’t really considered much of a tourist destination, which is quite evident as when I was there I happened to be the only visitor. I’m not actually sure why the local government has allowed the temple to become so run down, but I’m sure that with a little TLC it could become an important tourist destination for people visiting Yilan. The Lingxing Gate traditionally acts as the entrance to a Confucius Temple. The gate typically forms a perimeter around the courtyard and the Dacheng Hall with halls connected to the gate on either side of the interior. In most cases the gate is likely to be the most ornate part of the entire temple with murals to the sides of the main entrance as well as intricate designs on the roof but in the case of the Yilan temple, there is very little in terms of design and comes across as very plain. The Dacheng Hall which translates loosely as “The Hall of Great Perfection” is the main shrine area of any Confucius temple. The hall traditionally sits in the middle of a large cobblestone courtyard on an elevated platform with a walkway around the perimeter. The interior of the hall is a very simple set up with the Confucius Spirit Tablet set up on the main shrine with two plaques above it that read "Education for all" (有教無類), a phrase taken from the Analects of Confucius (論語) and “The Teacher for all Ages” (萬世師表) which is a phrase used to pay honour to Confucius. There are an additional two shrines in the room found on the left and right walls of the hall which are dedicated to the “Four Sages” (四配) Yan Hui (顏子), Zengzi (曾子), Zisi (子思) and Mencius (孟子). The Four Sages were Confucian scholars who helped to improve upon and spread the philosophy created by their master. The Dacheng Hall at the Yilan Confucius Temple has a design that differs from most of the other Confucius Temples in Taiwan which to its credit is one of the few aspects of this temple that makes it stand out from the others. Most notably, from the exterior it looks like it is two storeys in height but in actuality only has one floor with a shrine room that is considerably higher than what you’d generally see in a temple of this kind. Also of note is the beautifully designed roof which has two different levels with pillars that separate them - while the roof could look better with some of the designs that are common with the other Dacheng Halls around Taiwan, it has been taken over by nature with plants growing on top of it, which I think adds to its beauty. The Chongsheng Shrine is traditionally situated behind the main Dacheng Hall in all Confucius Temples. The shrine is used to venerate several generations of the ancestors of Confucius in addition to the various Confucian sages and philosophers throughout history. This shrine room is not unlike one that you'd find in any large Taiwanese home and acts as an important place for the ancestral worship of Confucius’s descendants, who have spread throughout China, Taiwan and Korea. The Confucius Temples that you find around Asia thus act as an ancestral shrine which offers the family a place to worship. The Chongsheng Shrine at the Yilan Confucius Temple in particular is a small one and strangely unlike almost all of the other Confucius Temples in Taiwan isn’t open to the public. You can look at the interior of the shrine from the door but there is a gate that blocks access. The Yilan Confucius Temple is situated within the downtown core of Yilan City and is about a ten minute walk from the Yilan Train Station (宜蘭車站). From the train station simply make a right turn on Yixing Road (宜興路) and once you reach the Donggang Overpass (東港路橋) make a left turn on Xinxing Road (新興路) and keep walking straight until you reach the temple. If you are driving a car, the temple is located at #170 Xinxing Road (170號新興路) and should have street parking nearby. The Yilan Confucius Temple isn’t really what I’d consider a tourist destination but if you’re in the area and are looking for something to do, you might want to consider stopping by. A visit to the temple won’t require much of your time and if you do visit you’ll also be within walking distance of the Dongmen Night Market (東門夜市), the historic Yilan City God Temple (宜蘭城隍廟) and the cutesy Jimmy Park (幾米公園) in front of the Train Station. When tourists visiting Taiwan want to experience a bit of traditional culture they almost always make their way to Taipei’s beautiful Longshan Temple. The historic temple is one of the best and most easily accessible examples of Taiwanese traditional culture, art and architecture and is always packed full of worshippers going about their daily routines. What many fail to realize however is that Taipei’s popular Longshan Temple is only one of several temples around Taiwan (as well as China, Hong Kong, Singapore, Malaysia, Thailand, etc.) which share the same name. There are currently eight temples throughout Taiwan and its outlying island territories where you can find a ‘Longshan Temple’ - Of those eight temples, five of them are historically significant in buildings which date between the 17th and 19th centuries. For westerners, I suppose its easiest to compare how the various denominations of the Christian church have set up a network of branches all over the place. Here in Taiwan the situation is very similar with major temples like Longshan Temple (保安宮), Qingshui Temple (清水祖師廟), Bao-An Temple (保安宮), Confucius Temple (孔廟) all having branches in several locations throughout the country. While the majority of Taiwan’s most significant Longshan Temple’s were constructed in the 1700’s, the baby of the group, Tamsui’s Longshan Temple might not have such a storied history, nor is it as popular as its siblings but it does nonetheless have a charm of its own and should be on the list of every tourist’s itinerary if they are planning to visit Tamsui. The Longshan Temple’s of Taiwan have a history that is directly related to the early migration of Hokkien Chinese settlers from China’s Fujian Province (福建省). Starting in the early 1600’s, due to the political instability of the Ming Dynasty (明朝), many people hailing from the Fujian and Guangdong areas made the decision to pack up and move across the Taiwan strait and throughout South East Asia. Bringing their language, culture, cuisine and folk religion, the Hokkien people sought to make a go of it in what was then a very under-developed Taiwan. The original Longshan Temple which received its name thanks to its location on Dragon Mountain (龍山) in Fujian, was constructed during the Tang Dynasty (唐朝) somewhere between 618-619. The temple, like every other Longshan Temple that followed it is dedicated to the Buddha of Compassion whom in the Chinese Buddhist tradition takes the form of Guanyin (觀音菩薩), a female Buddha. Non-Chinese Buddhists are likely more familiar with Tibet’s Buddha of Compassion who appears in human form as the Dalai Lama. Here in Taiwan the tradition that these temples would be dedicated primarily to Guanyin has continued but as the centuries have passed they have evolved and started to accommodate Taoist and local folk religion deities as well - many of whom also hail from the Fujian region. 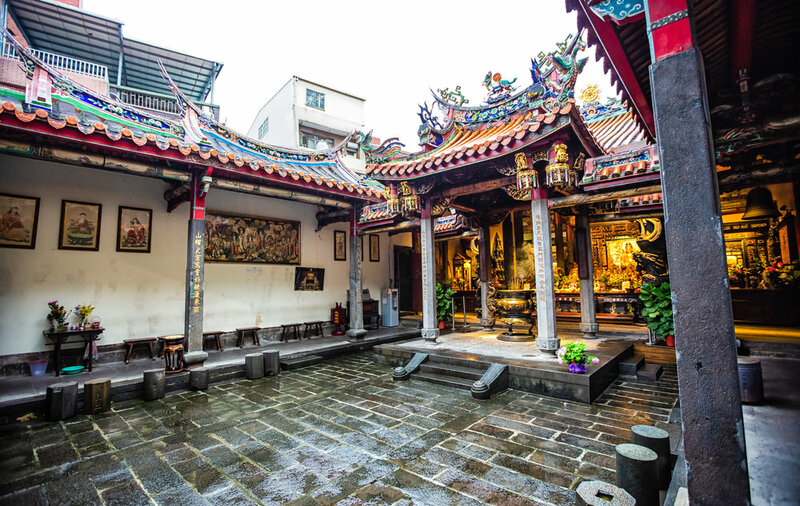 Even though you can now find several deities housed within Taiwan’s various Longshan Temples, the fact remains that the majority of the religious practices that take place inside are rooted in ancient Chinese Zen Buddhist tradition. Something that I can’t underscore enough about the religious experience in Taiwan compared to the west is that temples like Longshan Temple have the ability to house gods from what are considered to be different religions yet there are never any problems that arise from this. The religious experience in Taiwan is one of tolerance and should act as a model for those around the world who would use their religious beliefs to cause harm to others. The Hokkien people who brought with them their cultural and religious practices constructed their first Taiwan branch of Longshan Temple in Changhua’s historic port town of Lugang in 1647 and later constructed several others. Today there are five temples in Taiwan with histories that date between 160 - 370 years which were all constructed during the Qing dynasty. Each of the temples differs in its design, but they all share a similar history and purpose making the Longshan Temple’s of Taiwan an important place of worship and historical value. Tamsui’s Longshan Temple was originally constructed in 1853 by residents of the Tamsui port area who had immigrated from the Quanzhou (泉州) area of Fujian. Unfortunately after only a few short years the temple burnt to the ground. In 1858, the current version of the temple was reopened and even though it has been repaired and renovated several times over that period of time, it still maintains its original design. In comparison to the other Longshan Temples around Taiwan, the Tamsui version is a considerably smaller place of worship - Its beauty however lies in its design and its simplicity. The entrance to the temple is strangely in a dark, covered traditional market that makes the temple seem somewhat mysterious from the outside. The elaborately decorated traditional stone-front temple facade even on the brightest of days is barely visible. The entrance however opens up to a beautifully naturally lit interior that tends to transform depending on the weather. On sunny days the temple shines - on rainy days the colours of the temple are accentuated by the dull grey skies with clouds of burning incense. As is tradition, the temple was constructed sitting in the west and facing east (座西朝東) and has a simple ‘two-hall and two-passage-way’ design (兩殿兩廊式). Basically what this means is that the temple was constructed according to Feng Shui for great energy and is rectangular in shape with two different sections - a common design for temples. The entrance area forms one of the ‘halls’ (殿) with an open-air courtyard in the middle. There are two covered walkways (走廊) on either side that lead to the rear hall where the main shrine is located. Considering its size, the temple only has one shrine room but the decorations in the interior not only show their age but the expert craftsmanship of Taiwanese temple architecture. The wood and stone work inside is beautiful, especially the large wooden plaques with calligraphy that hang from the ceiling. The main shrine is (of course) dedicated to Guanyin (觀音菩薩), the Buddha of Compassion. But what you might find interesting is that all three of the shrines in the temple are dedicated to popular female deities from Buddhism, Taoism and Chinese folk religion. The statue of Guanyin is a large golden one with beautifully hand-painted calligraphy in the background. To her right is a shrine to the Goddess Mazu (天上聖母), the patron-saint of Taiwan and to her left is a shrine to the Goddess of Child Birth (註生娘娘) rounding out the all-female cast of deities. It probably goes without saying that when people pay a visit to the Child Birth Goddess they’re looking to have success in becoming pregnant or divine protection for a safe and healthy delivery. Guanyin, the principle deity of Longshan Temple on the other hand serves a myriad of different roles - Known as the goddess of mercy, her name loosely means that she ‘hears the cries of mankind’ and seeks to help solve people’s problems. A visit to Guanyin is thus important when seeking protection for your family, health, career, etc. Finally, Mazu, as mentioned above, serves as the patron-saint of Taiwan and especially those who work on the seas - There are over a thousand places to workshop Mazu around Taiwan with most shrines historically constructed in port areas by fishermen who wanted to express gratitude for watching over them while out at sea. As the patron-saint of Taiwan however Mazu has over the years transcended her traditional role as protector of the seas to the protector of the nation. People of all walks of life in Taiwan pay respects to the goddess and also request protection for theirselves and their families. Tamsui’s Longshan Temple is a short walk from the Tamsui Metro Station (淡水捷運站) and makes for a great visit if you are taking the time to visit the Danshui Old Street (淡水老街). Somewhat hidden within a bustling traditional market, there isn’t much signage in English that will point you in the direction of the temple which means that you’ll probably want to follow Google Maps for this one. From the Metro Station you’ll want to follow Zhongshan Road (中山路) into the downtown area of Tamsui making a right turn when you arrive at Zhongshan Road Lane 8 (中山路8巷). From there you’ll walk up the hill for a minute or two before you turn right into a market alley on Qingshui Street (清水路) which you will walk down for a minute before turning left and seeing the main entrance to the temple. While visiting Danshui, apart from the other obvious tourist destinations, you may also want to consider visiting the local Qingshui Temple (清水祖師廟) and the historic Fuyou Temple (福佑宮), one of Danshui’s most important and historic places of worship. If you are like many other tourists who make visiting Tamsui part of their Taipei itinerary you’ll definitely want to include a visit to the local temples to enjoy a bit of the storied history of the area that you will completely miss while walking down the so-called “old street”. Tamsui played an instrumental role in the development of Northern Taiwan and you don’t have to look very far for its history. Its on display all over its streets. Try not to be like all the other tourists walking around with their giant ice-creams thinking they’ve seen the real Tamsui. A visit to Tamsui’s Longshan Temple will be a completely different experience than what you will have at Taipei’s temple - The relative peace and quiet of the Tamsui temple allows guests to walk around and really appreciate the fine details of the beautiful artwork and architecture without a billion other people getting in the way.